Happy Friday! I’m still adjusting to being back in the US, but it’s nice to be back to my normal schedule…although it was tough to get used to cooking for myself again! I decided to challenge myself this May by giving up dairy, because I’ve recently realized that some dairy gives me a stomach ache. I’ve been dairy-free since Tuesday, and I have to say that I certainly miss my feta! 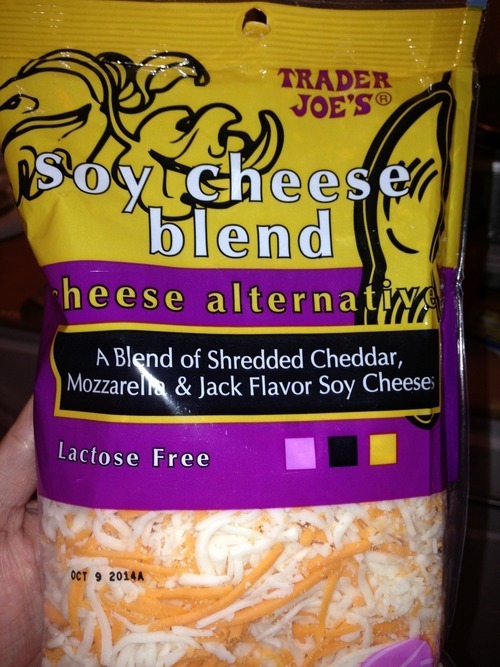 I found some shredded soy cheese at Trader Joe’s, which actually tastes and melts just like real cheese (it’s sort of a mozzarella-cheddar blend). However, I couldn’t find any soy feta…anyone know if that exists?? If so I need it! For my meals this week, I decided to make a chicken and veggie stir-fry with pasta sauce. I needed a break from carbs after my baguette-filled week, so I wanted to make a filling meal that didn’t require the addition of any pasta, rice, etc. The stir-fry was perfect and had a lot of flavor, plus the chicken and veggies kept me full! Preheat oven to 350 degrees. Bake chicken breasts with olive oil and seasonings for about 20 minutes, or until fully cooked. Cut chicken into small pieces. Steam frozen broccoli in the microwave per package instructions. While broccoli is steaming, heat 2 tbsp olive oil on a skillet over medium heat. Add garlic, onions, and peppers, cooking until tender. Add the broccoli and chicken and stir together. Add red pepper flakes and garlic powder to taste. Remove from heat and add to a bowl with pre-heated pasta sauce. Stir together and top with shredded cheese, if desired. Enjoy! NOTE: I recently discovered that they sell bags of frozen diced onions with strips of red and green peppers, all in one bag! It’s basically a frozen stir-fry, and you don’t have to cut the veggies, just throw the frozen ones on the skillet and cook them. I love this because I hate cutting onions; this prevents the smelly hands and crying! I used that in this recipe instead of fresh veggies, but either will work!